At the core, we call Historic Downtown McMinnville home, a kinetic small town community of farmers, designers, growers and craftspeople. Basking in the middle of Oregon’s scenic and bountiful Willamette Valley, our town enjoys a generous helping of the Pacific Northwest’s many offerings, from incredible food, wine and hospitality to awe-inspiring natural wonders. 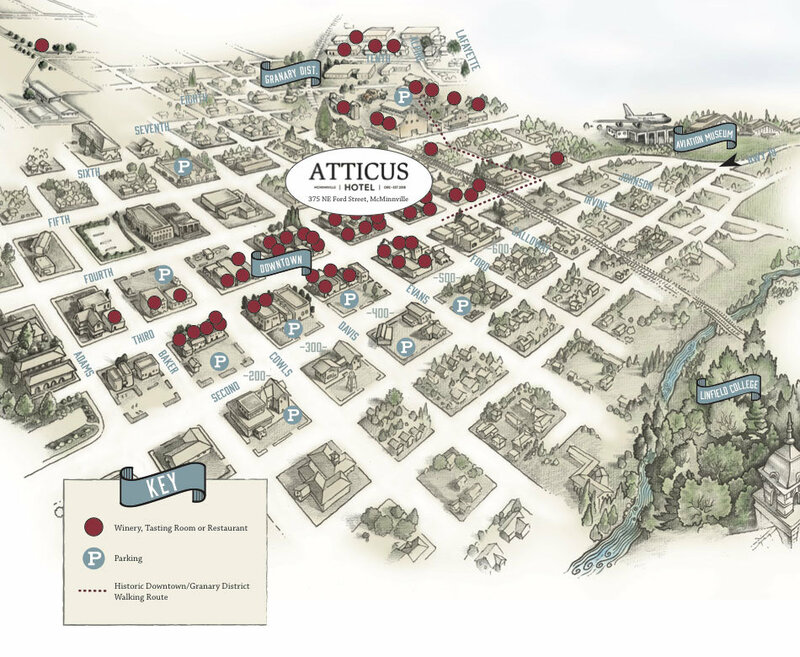 From the Atticus Hotel you can easily walk to 18 tasting rooms, 35 restaurants and a bevy of eclectic boutiques in downtown McMinnville, or journey out of town to one of 200 wineries within a 20-minute drive in any direction. Bookended by two stunning mountain ranges, the Willamette Valley is a lengthy patchwork of rolling vineyards, orchards, farmhouses and untouched strands of forest. The Valley is a world unto itself worth exploring but also a short drive to the diverse terrain that Oregon is beloved for. The Pacific Ocean, high desert, ancient forests, snow-capped mountains, blue-ribbon rivers and striking gorges are all within driving distance of the Atticus Hotel. This is to say nothing of the countless welcoming towns that dot the Valley and beyond and our eclectic metropolis, Portland, just an hour’s drive north of here. We experience all four seasons at the Atticus Hotel, each one having its long list of merits. Spring is mild and wet, with a palpable sense of excitement rooted in McMinnville’s rich agricultural legacy. The long, warm days of summer are celebratory and filled with iconic festivals and outdoor dining. Autumn is harvest time, when hillsides go aglow with bright colors and the region’s many wineries and breweries bustle with artisanal activity. Winter spells intimacy, a peaceful stretch made extra cozy courtesy of McMinnville’s signature charm and hearty seasonal fare. Our concierge can outfit you with everything needed to experience Oregon’s limitless beauty. Whether it’s a stroll to the nearby Granary District for a glass of wine or a day trip to Cannon Beach to gallery hop, the Atticus Hotel can get you there, with an informed itinerary in hand.